Written by Catherine Saxelby on Wednesday, 17 January 2018. Trans fats are a nutrition no-no. Yet they’re in demand for many and varied quality reasons. For instance, they make food taste crisp and crunchy, they are more stable so food lasts longer on the shelves, and they cost less. However, they’re a hazard for your heart and are now thought to be a trigger for inflammation and metabolic syndrome. So where are they and how do you avoid them? Here are my top 13 worst offenders to steer clear of. Many food manufacturers and fast-food chains have removed or reduced trans fat content. The Monitoring Round Table run by the Australian government has worked in partnership with food companies and fast food operators to get trans fats out of the food supply. It produced two reports in 2007 and in 2009 with good improvements. These fats still lurk in many foods. They’re the industrial trans fatty acids. The more junk food and deep-fried rubbish you eat, the more you’ll consume. So avoid these and you’ll avoid most trans fats – along with a heap of salt, added sugar and refined starches. How are trans fats formed? Naturally: They are made by bacteria that live in the forestomach (or rumen) of cattle, sheep, goats and deer. This means that they occur naturally in meats such as beef, lamb, goat and venison, as well as dairy products that come from these animals such as milk, cheese, butter and cream. There’s little evidence against these but it’s good to know they exist. Industrially: They are formed when fats and oils are hydrogenated or deodorised. During hydrogenation, liquid vegetable oils are hydrogenated (hydrogen is bubbled through them in the presence of a catalyst) to transform them into solid and semi-solid fats. This process changes the molecular structure of the fatty acids which results in a portion – from 30 to 60 per cent – changing to the trans form. Trans fats are the chemical opposite of the usual cis form – see here for more. Where do you find trans fats? For centuries, human beings have been consuming them in small amounts from butter, milk, beef and lamb. So the consumption of trans fats is not new. Think everything from a glass of milk to a pot of dripping under the sink. The good news is that there is no evidence that the natural forms of trans fat is dangerous. However, the manufactured forms of trans fats are a different story. Way back in the 1970s, animal fats such as butter, pork lard and beef tallow were accused of contributing to heart disease and cancer, thanks to their saturated fat content. To address this health scare, manufacturers then switched to vegetable oils which were perceived as healthy because they contained little saturated fats. However, manufacturers had to find a way to make them solid to help with texture, spreadability, crispness and shelf life. If you want potato fries without tallow or a Danish pastry without butter or baker’s fat, you’ve got to somehow solidify the oil! Hydrogenation of fats made this possible. Most animal fats like butter naturally contain around 3 per cent of their total fat as trans fat. If you compare this to a hydrogenated commercial shortening which is used in baking, you will be alarmed to find that the shortening contains a high 30 per cent as trans. That’s 10 times more than that naturally occurring in animal fats - and that’s why health professionals are worried about trans fats. Movie popcorn - Popcorn in itself is a healthy snack and sports a serving of whole grains to boot. But when you pour on the buttery toppings, there's no telling what you're really adding. Movie popcorn is the worst as it’s coated in solid coconut fat. Just the smell of it when you enter a shopping mall should warn you. Blended vegetable oil - Doesn’t matter whether it’s mono- or polyunsaturated, this cheap supermarket oil has trans fats produced during the refining and heating stages. Any deep-fried fast food items such as French fries, chips, wedges, battered fish and nuggets. These foods have been deep-fried in partially hydrogenated oils unless they tell you otherwise (sometimes they advertise they cook in cottonseed oil). Non-dairy coffee whiteners - For coffee lovers, non-dairy creamers can become an integral part of your morning. Over time, however, they can also add a considerable amount of trans fat to your diet. To determine whether your non-dairy creamer contains trans fat, simply check the ingredient listing for "partially hydrogenated oils." Nestlé who make the market leader Coffee Mate now declare that they’ve removed partially hydrogenated oils from the ingredients. Read more about it here. 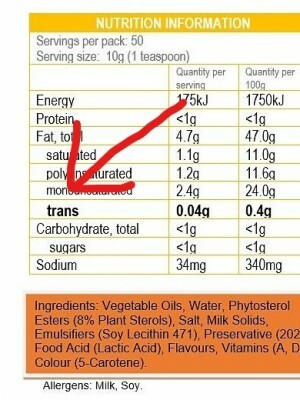 Are trans fats on the label? At present, manufacturers are required to list ONLY the total fat and saturated fat – not the trans fat. But if a claim is made such as ‘No trans fat’ or ‘No cholesterol’, then the amount of trans fat has to be listed on the nutrition information panel at the back. Almost all margarines say this. Companies are allowed to round down and put “0 grams” on the Nutrition Panel if their product has less than 0.5 grams of trans fat per serving. Where possible, use oils such as olive and sunflower oils, instead of margarine and butter. For instance when baking a cake, look for a recipe that works well using oil instead of solid fats – banana or carrot cake work well. Choose a soft spread over a hard margarine (cooking margarine) or butter. Most spreads today are made with less than 1 per cent trans fat. Avoid buying commercial cakes, slices, biscuits, muffins, quiches and pies. Instead bake these at home using soft margarine or occasionally unsalted butter. Avoid bought pastry, including shortcrust and puff. Avoid deep-fried fast food unless you know a low-trans oil has been used (McDonalds has switched to a low trans canola-based oil which is a good step). In any case, these foods are not healthy take-aways and you shouldn’t eat them regularly. Roundtable on Health Government initiative. Read more about Trans fatty acids. WHO released a step-by-step guide for the elimination of industrially-produced trans-fatty acids from the global food supply. WHO estimates that every year, trans fat intake leads to more than 500,000 deaths of people from heart disease. May 2018. Q. If I stick to vegetable oils will I avoid saturated fats? Q. I’m confused. I know what polyunsaturated means, but what’s monounsaturated?